When I got the privilege to learn natural beauty from makers in Bali, it hit me how I had been overcomplicating my life back home. I stood there watching my teacher make this amazing face mask out of three ingredients: she grated a cucumber with all the juice, the pulp and skin. She mixed in a bit of ground rice and coconut oil. No measurements. No fuss. It was like watching my mother cook in her kitchen. And then I tried this simple mask on my skin – and I was blown away. My skin felt fresh and clean and soft. So soft. I’m thinking to myself, how much money do we spend on buying expensive products just because they’re natural? Stressing over chemicals, labels, trying to keep up with it all. Filling our cabinets with products that our skin doesn’t need or want. The average is 16, that’s how many different types of products we put onto our skin everyday. Watching my teacher work with such simple ingredients sent me home with a fresh perspective. The same foods that nourish your body can heal, protect, soften, clean, brighten and enhance your skin. Let me show you to show how to swap four common skin-care products with simple whole foods that you probably have in your pantry right now. No measurements. No fuss. Blown away good for you! Coconut oil. It’s gentle and nourishing on the delicate skin around your eyes, yet it’s able to break down and remove liquid liners and mascara. Honey. It won’t remove makeup, so it’s best used on morning skin. When you wake up, instead of washing with soap or cleanser, gently massage raw honey onto your face and wash off. Its highly antibacterial, will cleanse your and hydrate your skin. Apple Cider Vinegar. Our skin likes to be slightly acidic, apple cider vinegar helps to rebalance and restore you pH. Our skin can do this naturally, but a lot of the harsh products, soap and cleanser knock you off balance. Simply apply it onto a cotton pad and all over your face. Dilute 1 tbsp apple cider vinegar with 1/2 cup water. Sugar + Oil. My favorite for the body is coconut oil. Incredibly antibacterial, it’s cleansing and full of nourishment that will help repair and protect your skin at a cellular level. For the scrub, try one part fine salt + 1 part soft brown sugar. This is the secret that creates a soft, rich scrub. Pour in your oil until it reaches a wet sand consistency. That’s it. This is one of my favorite products to teach, you get that instant gratification, your skin feels amazing! It shows you just how simple it can be to keep your skin feeling and looking its own best. so beautiful! 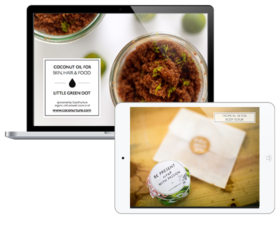 For more whole food skincare recipes, join my mailing list where I share fresh new skincare treats each week, along with exclusives that only my subscribers receive. Love this website. Thank you for bringing us healthy, simplistic ways of keeping our bodies healthy and fresh.. Thanks Lenore – it started as a passion, but now it’s turned into a mission! Thanks so much for reading and your kind words – it’s what keeps me going ? Food is the natural resource for healthy and glowing skin. So this blog gives all the useful information for healthy skin. Thanks for sharing this post with all of us. Love the look of the new website! !